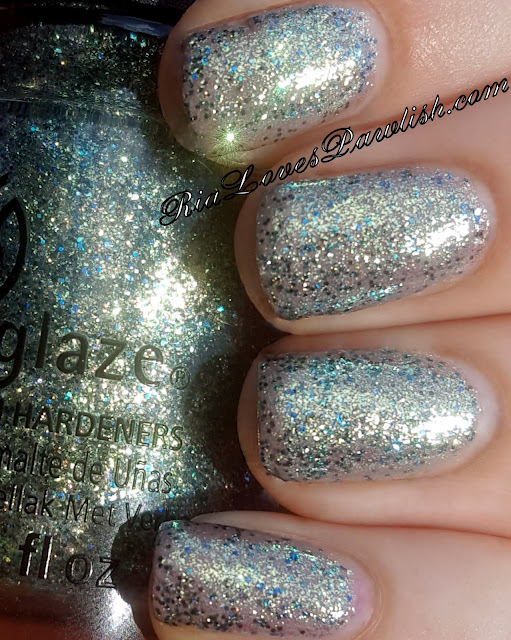 Ria Loves Pawlish: China Glaze Rebel... Holo At Ya Girl! Holo At Ya Girl! is today's China Glaze Rebel polish. (press sample, kindly provided to me for review). it's an ultra sheer purple base packed with different colored microglitter, mostly gold, blue, green, and holographic! once on the nail, your eye doesn't really pick out the different colors so much, it's just this yummy sparkling foil looking nail. it would take quite a few coats to get it opaque on its own, but i love it after just one coat when layered over another polish! it really becomes quite dynamic and color changing... it's one i can sit and stare at for quite a while... you know, one of those dangerous to wear while driving ones! once i had put it on, i just couldn't take it off, even though i had planned to try some other polishes :D as there is glitter, i highly recommend topcoat to seal all the bits in and bring out all the shinies. for this photo i put it over China Glaze Dope Taupe (pr sample). it gives the look of gold shifting to blue/green foil... in bright light at some angles you see the sheerness and it gives you a more purpley look. i feel like you just don't really notice the holo, they just add incredible sparkliness! one coat Holo At Ya Girl! over China Glaze Dope Taupe, finished with one coat FingerPaints Fast Dry Top Coat.